If you’re like most people, you’ve endured challenges in life. 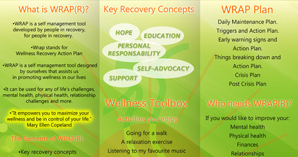 The Wellness Recovery Action Plan, or WRAP, was formulated to help you manage the challenges that have the potential to threaten your well-being. WRAP is a self-management tool designed to improve your mental health, physical health, relationship issues, and financial problems, among other things. Say, for instance, you’ve been hit by a major life challenge such as a bereavement of a loved one, a financial crisis, or an injury or illness. Being hit with any of these life challenges is enough to derail someone. You could surely use a bit of support – WRAP is a tool that health professionals recommend to get you to a place of complete wellness. The WRAP recovery system was developed in 1997 under the guidance of Dr. Mary Copeland. How will WRAP help me? WRAP takes a holistic approach to recovery. Wellness as a concept is interested in all aspects of your life. To learn more contact us helen@mindbodyenergymatters.ie today.